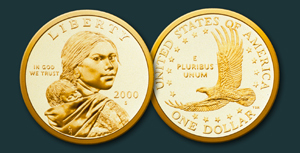 The Golden Dollar's obverse (front) side, designed by American sculptor Glenna Goodacre, depicts the young Shoshone woman, (Randy’L He-Dow Teton modeled for the coin) Sacagawea, who accompanied Lewis and Clark on their journey from the Great Northern Plains across the Continental Divide to the Pacific. Historians note that Sacagawea's exceptional diplomatic and navigational skills contributed greatly to the success of the mission. She carried her infant son, Jean Baptiste, on her back throughout the course of the expedition. Her significant role as an American woman pioneer won her the distinction of gracing the nation's new coinage. The Golden Dollar's reverse (back) design, by Thomas D. Rogers Sr., presents a soaring American bald eagle encircled by 17 stars - symbolizing the states of the Union at the time of the Lewis and Clark expedition of 1804.